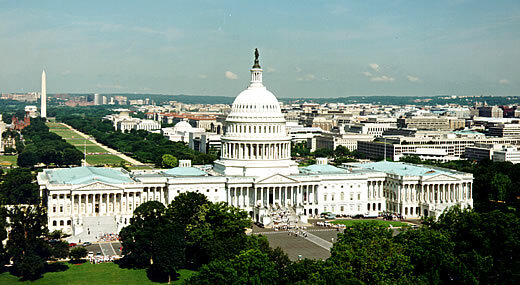 The United States Congress is part of the legislative branch and is made up of two houses -- the House of Representatives and the Senate. This two house system is known as a bicameral legislature. The primary duty of Congress is to write, debate, and pass bills, which are then passed on to the president for approval. Other congressional duties include investigating pressing national issues and supervising the executive and judicial branches. Every two years, voters get to choose all 435 representatives and a third of the senators. The entire House membership faces re-election every two years, but the Senate is a continuing body because there is never an entirely new Senate. A new Congress begins in January following Congressional elections. Since the First Congress, which met from 1789 to 1791, all Congresses have been numbered in order. Congress meets once every year and usually lasts from January 3rd to July 31st, but in special cases, a session can last longer. For the most part, the House and Senate each meet in their respective chamber in the U.S. Capitol in Washington, D.C.; however, on rare occasions, they will convene for a joint session of Congress in the House chamber. For example, a joint session will be called to count electoral votes for presidential elections. When the Constitution was being drafted, a debate broke out between states with large populations and those with smaller populations. Each had a different opinion about how the states should be represented in the new government. To be fair to each group, a compromise was reached. 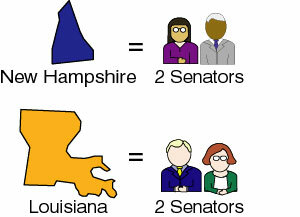 By dividing Congress into two houses, the House of Representatives would favor states with larger populations, while the Senate would favor those states with smaller populations. There are a total of 435 members in the House of Representatives. Each member represents an area of a state, known as a congressional district. 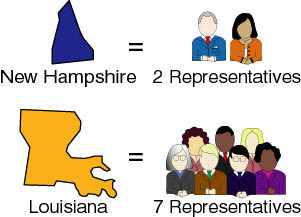 The number of representatives is based on the number of districts in a state. Each state is guaranteed one seat. Every ten years, the U.S. Census Bureau counts the population of the states to determine the number of districts in each state. Representatives, elected for two-year terms, must be 25 years old, a citizen for at least seven years, and a resident of the state from which they are elected. Five additional members—from Puerto Rico, Guam, American Samoa, the Virgin Islands, and the District of Columbia—represent their constituencies in the House. While they may participate in the debates, they cannot vote. Start laws that make people pay taxes. Decide if a government official should be put on trial before the Senate if s/he commits a crime against the country. There are a total of 100 members in the Senate. The Constitution states that the vice president has formal control over the Senate and is known as the president of the Senate. In actuality, the vice president is only present for important ceremonies and to cast a tie-breaking vote. Senators, elected for six-year terms, must be 30 years old, a citizen for at least nine years, and a resident of the state from which they are elected. Confirm or disapprove any treaties the President drafts. Confirm or disapprove the Presidential appointments, such as the Cabinet, officers, Supreme Court justices, and ambassadors. Holds a trial for a Government official who commits a crime against the country. First senators elected: Robert Morris (PA) and William Maclay (PA), September 30, 1788. First former senator to be elected president: James Monroe (VA), November 1816. First incumbent senator to be elected president: Warren Harding (OH), November 2, 1920. First former president to be elected senator: Andrew Johnson (TN), March 4, 1875. First woman senator: Rebecca Felton (D-GA) was appointed to the Senate, and took the oath of office on November 21, 1922. First woman elected: Hattie Caraway (D-AR), January 12, 1932. First "First Lady" to be elected senator: Hillary Clinton, still serving as First Lady of the United States, took the oath of office on January 3, 2001. First African American: Hiram R. Revels (R-MS), took the oath of office on February 25, 1870. On January 5, 1993, Carol Moseley-Braun (D-IL) became the first African-American woman to take the oath as U.S. senator. First (and only) father and son to serve in the Senate simultaneously: Henry Dodge of Wisconsin served in the Senate from 1848 to 1857, and his son, Augustus Dodge of Iowa, served from 1855 to 1858. First (and only) senator to represent three states in the U.S. Senate: James Shields represented Illinois from 1849 to 1855, Minnesota from 1858 to 1859, and Missouri in 1879. First senator to serve 30 years: Thomas Hart Benton (D-MO), 1821-1851. First senator to chair a standing committee for 24 years: William Allison (R-IA), 1881-1893; 1896-1908 (Appropriations Committee). First officially designated Democratic floor leader: Oscar Underwood (AL), 1920. First officially designated Republican floor leader: Charles Curtis (KS), 1925. First woman to chair a standing Senate committee: Hattie Caraway chaired the Committee on Enrolled Bills, 1933-1945. First radio broadcast from chamber: March 4, 1929. First television broadcast from chamber: December 19, 1974 (Vice President Nelson Rockefeller takes oath of office). First regular television broadcast from chamber: C-Span began Senate coverage on June 2, 1986. First cabinet nominee rejected by the Senate: Roger Taney (Secretary of the Treasury), June 24, 1834. First Supreme Court nominee rejected by the Senate: John Rutledge, December 15, 1795. First treaty rejected by full Senate: with Colombia regarding suppression of African slave trade, March 9, 1825. First permanent Senate office building opened: March 5, 1909 (Russell Senate Office Building). Coining money. Maintaining a military. Declaring war on other countries. Regulating interstate and foreign commerce Congress also controls federal taxing and spending policies—one of the most important sources of power in the government. The Constitution also gives Congress the authority to "make all laws which shall be necessary and proper," an implied source of power sometimes called the Elastic Clause. One of the most important implied powers is Congress’s authority to investigate and oversee the executive branch and its agencies, such as the Department of Defense and the Department of Justice. As part of this responsibility, which is known as oversight, Congress summons senior officials to answer questions from members, orders audits of agencies, and holds hearings to air grievances of citizens. Congress also holds hearings on matters of general public concern. Sometimes members of Congress conduct these hearings to identify problems that create a need for new laws. In other cases Congress holds hearings to raise public awareness about an issue. There are, however, some congressional powers that are rarely used such as the ability to impeach an official and the ability to amend the Constitution. In addition to the power described above, Congress shares powers with the president in matters such as, framing U.S. foreign policy and control over the military. For example, while the president negotiates treaties, they are only put into effect once the Senate approves them. Also, while Congress can declare war and approve funds for the military, the president is the commander-in-chief of the military. 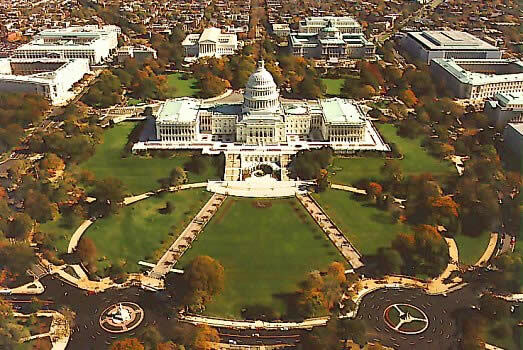 Today, the Capitol covers a ground area of 175,170 square feet, or about 4 acres, and has a floor area of approximately 16-1/2 acres. Its length, from north to south, is 751 feet 4 inches; its greatest width, including approaches, is 350 feet. Its height above the base line on the east front to the top of the Statue of Freedom is 288 feet; from the basement floor to the top of the dome is an ascent of 365 steps. 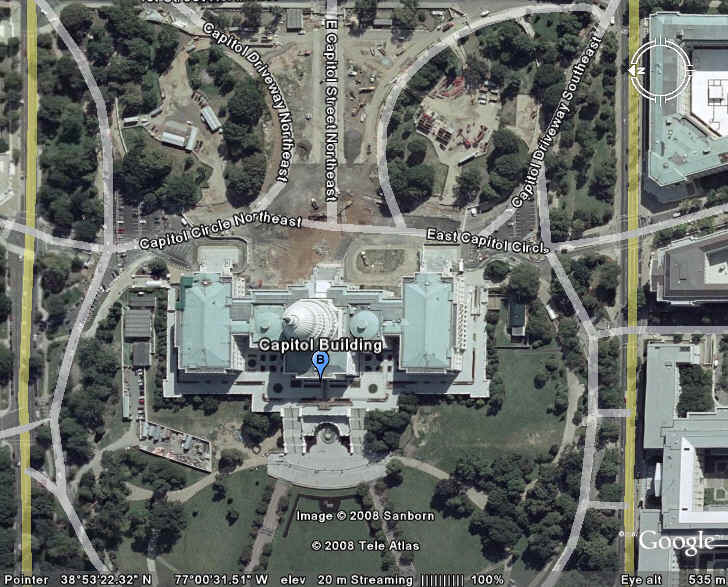 The building contains approximately 540 rooms and has 658 windows (108 in the dome alone) and approximately 850 doorways.